The MotoGP World Championship raced at the Indianapolis Motor Speedway from 2008-2015 in the Red Bull Indianapolis Grand Prix. MotoGP competed on a 16-turn, 2.591-mile road course at IMS that run counter-clockwise - the direction of the oval events - and incorporated the iconic front straightaway, a newly renovated infield road section and the short chute between Turns 1 and 2 of the oval. 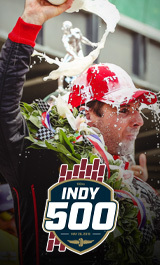 Following eight years of delivering world class motorcycle racing, the Red Bull Indianapolis Grand Prix was not on the 2016 event schedule for the Indianapolis Motor Speedway. The award winning MotoGP event was first hosted at IMS in partnership with Dorna Sports in September of 2008. The cancellation of the race was a mutual decision by both parties. Following the removal of the Mazda Raceway Laguna Seca from the MotoGP schedule in 2014, the Red Bull Indianapolis Grand Prix became the only summer MotoGP event in North America for the last two seasons. This caused both financial and logistical challenges that no longer made the event viable for the foreseeable future. Ultimately, removing the Indianapolis race became key to Dorna's efforts to expand both the number of events it hosts and the geographic diversity of its schedule.